Every time an occasion came up to shop for my mother, I'd head for the department stores and spend, literally, hours walking around. The problem, my friend screenwriter and wit Douglas Kalajian would point out, was "Failure to Check." First, I hadn't checked what size she might be (why doesn't more girl stuff come in "Medium"?). Second, I had failed to observe what kinds of things she bought for herself, or wore, and I thus had no idea what she might like. Third, I had no idea what to shop for; why hadn't I just asked for a hint? 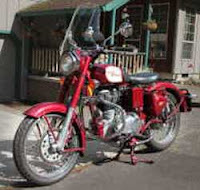 So I think I truly understand what happened to "Don" in Oregon, when he bought his wife a 2009 Royal Enfield C5 — without asking. Now it's up for sale. "It was an impulse buy and with six other motorcycles, I really did not need this one. It was just so cute, I could not resist," Don wrote in his for-sale ad. "I told my wife I bought it for her, and that it would be more fun than her 650 Suzuki. "Well, she did not agree, and said that if that was the reason for buying it, I made a mistake and should have consulted with her first because she likes her Suzuki and does not want, or need, anything else." See? There you have it: Failure to check. "But I am so easy to shop for," my mom would insist, when I mentioned how much I suffered on her behalf. It sure didn't seem like it. Lucky for me I married a wonderful woman who shopped without complaint for my mom, for the next 30 years. My mom loved what she received and didn't seem to mind that I hadn't picked it out myself. At least she never had to return a motorcycle.